The number of fake pound coins in circulation may be twice Royal Mint estimates, the BBC has learned. Official figures suggest around 2.5% - or one in 40 - are copies, but coin testing companies say it is one in 20. Andy Brown of Willings, a firm which makes machines to check coins for other businesses and organisations, says there could be 73 million fake coins. The Royal Mint says it takes fraud extremely seriously and that it surveys the counterfeit rate every six months. Mr Brown said car parking firms, vending machine operators, local councils and even banks have sent their coins to Willings to be checked. He said: "We would estimate that as many as 5% of coins we test are fakes. "We've been collating them for the past four months or so, and already have a collection of several hundred." The figures quoted by the Royal Mint were wide of the mark, he added. Former Queen's Assay Master Robert Matthews - a leading authority on fake coins - is also worried. He said: "The Mint is really trying to play down the problem and keep it as low-key as possible. "They've not produced any publicity material for banks etc to tell us how to differentiate between real and fake coins. "They don't want to undermine public confidence in the coins, you might get people refusing to take them." Although it says little in public, the Royal Mint is taking action - testing far more coins than before. It redoubled its efforts last September after the BBC revealed around one in 50 pound coins was fake. 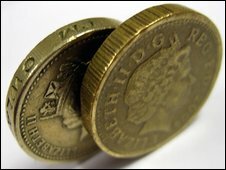 In the last quarter of 2008 the Mint removed 270,000 fake pound coins from circulation compared to 97,000 for the whole of the previous year. The problem is that finding the fakes is not in anyone's interests. As soon as a coin accepted in good faith is found to be counterfeit, it is immediately rendered worthless - and in addition attempting to pass it on is an offence. Mr Brown said: "Provided the coins are just being accepted and passed through the system nobody cares. It's only when people start rejecting the coins that people come to us." Not surprisingly, it is local authorities and the post office, rather than private individuals or small businesses, who are working hardest to identify the fakes - even if that means taking a financial hit. The aim for those dealing with coin-operated machines is to find mechanisms that will reject even the best forgeries. Mr Brown said: "We've been working for the last six months to create a new data file for our machines to detect fake coins. "We can manage a 50-60% detection rate while the machines being used by the Royal Mint can only pick up around 30-40%." That means even when fake coins do pass through security checks at accredited cash centres, two thirds will come right back into circulation. Mr Brown believes the Royal Mint's official figures on the number of fake coins will continue to rise. "Their percentage will go up as they get better at detecting fakes," he said. The Royal Mint inspects a random sample of coins from across the country to establish the twice-yearly official rate. A spokesman said the Mint was working with organisations such as the Post Office, banks, the vending industry and law enforcement agencies to try to limit the supply of fake £1 coins in circulation. "We are concerned at the apparent upward trend," added the spokesman. Mr Matthews, meanwhile, says there is no regulation and thinks it is time the government took ownership of the problem. He said: "There's a whole raft of organisations who should have been tackling this who haven't been tackling it. "It's like a game of pass the parcel. In the final analysis it's the Treasury who should be dealing with this - and checking the work of the cash centres." And for the rest of us? Finding a fake coin can be done by hand - just check the rim inscription for authenticity, or check the Queen's head on one side and the pattern on the reverse line up. But given that fake coins are worthless, you will almost certainly be better off not even looking. 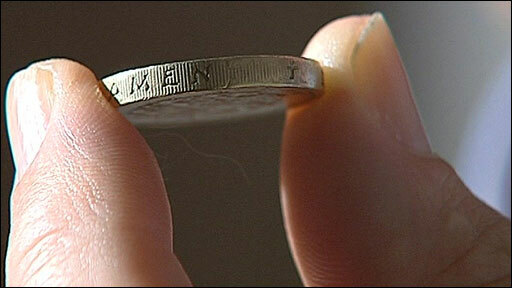 How do you spot a fake pound coin?